Pakistan Bank: Time to watch the Big-5! The Banking sector is currently in the limelight on account of fiscal tightening being witnessed where a comparison of the Big-5 versus the Mid-tiers makes for an interesting reading. The Big-5 currently trade at an avg. P/B of 1.01x compared to Mid-tiers at 1.06x.
? This contrasts historical average where the Big-5 commanded valuation premiums of 39.7% during CY14-17 (boom period) and 26.6% over CY08-11 (crises period).
? We believe a catch-up rally is on the cards within the Big-5 given exponential improvement in average CY19-20F ROEs to 15.2% compared to 9.8% in CY18F.
? That said, risks remain with provisioning costs likely to go up as the economy decelerates where we believe the bigger banks are better placed given higher exposure to GoP borrowing.
? While recommending a thematic exposure to Banks, we continue to like HBL and UBL from a growth perspective and MCB from a yield perspective. Within Mid-caps, we continue to advocate BAFL on account of higher interest rate sensitivity (1.2x). Stock market aur property markets Mai loggon k losses aur money ko stuck hota hua dekhtay hee foran Banking sector awaam Kay liay saving schemes laa raha hai like aaj T.V par Bank Al Habib ka Mahana Saving Account Wala advertisement .. jis Mai 10.10% annual return offer Kara Gaya hai..
Abhi bhi waqt hai stock n property market se nikalna shuru Karo.. shares ke values nothing.. becoz jab companies survival conditions takk ajati Hain Dividends daina bhi band kar daitee Hain.. Trend is changing.. follow new trend..
Stock of Borrowings from Central Bank has reached to 12.6% of GDP, the highest since FY06 whereas acceptable limit for IMF is assumed at 7.5-8.0% of GDP, necessitating a shift towards banks for borrowings. The latest PIB auction (though small in amount) in which yield spread (PIB yield – PR) enhanced to 2.2% can be taken as a link to such strategy. To recall, stock of borrowings from the central bank stood at 10.0% of GDP at the time of entry into the previous IMF program (Sep’13) which gradually receded to 9.2% by FY14-end, while the share of PIBs as a % of borrowings from banks stood at 19.0% at the start of the program, climbing to 53.4% by FY14-end. The banking sector is likely to aggressively pursue PIB accumulation (after learning from previous PIB episodes), where resultantly, financing growth is expected to jot down to below teens vs. 14.7% CY18TD. Banking sector would benefit from increased spread on the longer tenor bonds particularly when fresh yield on advances are bound to fall where the fall gets steeper when burdened by the cost of provisioning. UBL 165 stoploss aur HBL 160 stoploss..
(Bloomberg) -- Pakistan banking system outlook changed to negative from stable. 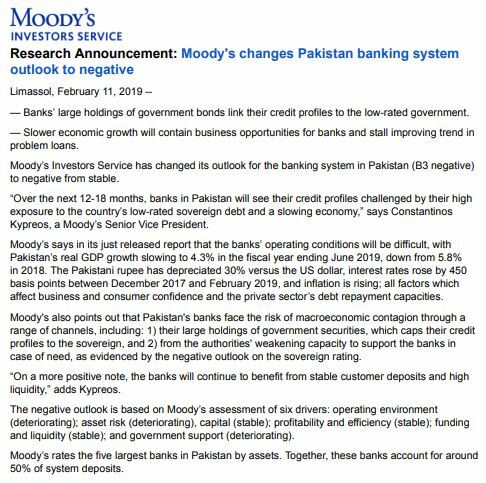 Moody’s Investors Service comments in a statement. mini budget passed. what about the 4% super tax concession. given or not? On Account of passing mini budget .. market will be in green today or the next day.. no further corrections expected.. resistance of index is 39900, if broke, then it will touch 40500 easily. For the ones who are wondering what happened to their bank shares. SBP called a meeting of Treasury personel on introduction of Treasury Single Account(TSA) with SBP. The objective of this account is to transfer federal government deposits maintained with Banks to SBP, which will reduce government borrowing from SBP. 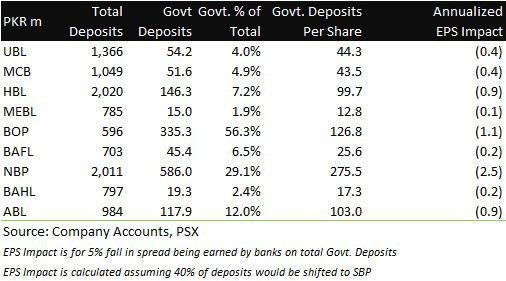 In the first phase(possibly may-June 2019), federal government deposits( estimated 800 bn) will be transferred. Under the proposed process, the amount outstanding at day end will be transferred to SBP before 5 PM. The same amount will be transferred back to the Banks next morning. Hence, Banks would only be managing the payments during the day. The banking sector deposit/liquidity will go down with the start of this process. In the second phase, same approach may be used for provincial government deposits of PKR 1 trillion(total 1.8 trillion). Banks will not get any float income on these deposits and may charge service charges depending upon the agreement with the client). To start with, government will inform the banks about the accounts that will be tagged for this process. Banks have to look at their system for tagging of such accounts and inform SBP about the system readiness in one week. In the mean time, SBP may send a questionnaire to the Banks for their suggestions on the process. SBP has informed that the decision has been made by the government and the process is being drafted and the banks will be informed through a circular. sheer window dressing and nothing else. in a normal company an auditor would point it out.